Whoa, Friday again! And what a Friday to wake up to. (Linguistic angle: a trending hashtag on Twitter today is #regrexit.) But anyway, on to the words! This week I'm inspired by a conversation at work about baseball, which yielded two new-to-me terms. The first is Mendoza Line. 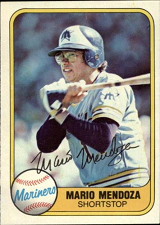 Mario Mendoza was a baseball player who played for various major-league teams in the 1970s and 1980s. One year when he played with the Seattle Mariners, he finished the season with a .198 average, well below the league average of .270 that year. In Mariner lore, it became a joke that someone who was hitting poorly might fall below the "Mendoza Line"—i.e., below .200. This term spread in baseball, especially via the ESPN show "SportsCenter." A sub-$2,000 per theater average means that it likely cost more for the studio to make and ship the physical print of the movie than their share of the box office. It is the Mendoza Line of box office numbers and regardless of the reviews, there's nearly no way to describe the film in positive terms. There's more detail in the Wikipedia article, should you be curious. After the game, Pirates manager Frankie Frisch demanded to know what, exactly, his pitcher had thrown to Wakefield. Maurice Van Robays, an outfielder with the club, replied that Sewell had thrown an eephus. When asked to elaborate, Van Robays said, "'Eephus ain't nothing, and that's a nothing pitch." There's speculation that eephus is related to the Hebrew word efes, which means "nothing." I have no authority on this beyond the article where I read all this. Onward to unexpected etymology. Today I have the word praline, the confection. I had no idea that this was an eponym, named after the Maréchal du Plessis-Praslin (a field marshal, I guess), whose cook is said to have invented this particular delight. (In the way of earlier eras, the actual inventor, a mere worker, remains anonymous.) We borrowed the word into English from French, and have cites that go back to the early 1700s. Anyway, there's your etymology; I'll leave for another discussion the question of how to pronounce the word.